Villa Dol is located on the hill above the village of Dol. 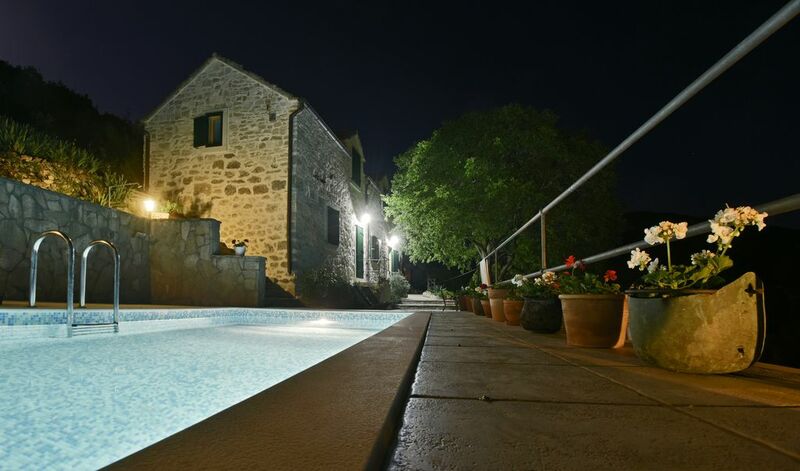 It is 200-year-old Dalmatian house renovated in traditional style, made of stone and surrounded by olive trees and beautiful garden; spread on 1500 m2. With pool and beautiful view, it makes unique combination of wilderness and human-made features suitable for secluded adventure, romantic excursions, family holidays and numerous variety of trips and exploration. You can relax in the front of the house which has extensive stone terracing and a 6m x 3m swimming pool with outside shower, sunbeds and parasol. Also, there is a 8 person table in the barbecue area and a smaller table in the shade of the tree in front of the house. Villa Dol is pet friendly. On the 1st floor there is 1 bedroom with king size double bed and 1 bedroom with twin beds. Also, 1 bedroom with king size double bed is on the ground floor. Restored furniture and hand-made lamps are in all rooms, which makes them unique and enjoyable. Spacious bathroom on the first floor, includes shower enclosure, toilet with bidet and two lavatories. Bathroom on the ground floor includes shower enclosure,toilet, lavatory and washing machine. There are cupboards and shelves in each bathroom. Kitchen is equipped with cooking utensils, dishwasher, microwave, espresso machine, fridge with freezer, cooker with oven, toaster and rice cooker, cattle and blender. Kitchen also has a beautiful rustic stone sink. Living and dinning room create great atmosphere thanks to hand-made lamps and wisely chosen literature (Eco-friendly books and travel guides) in order to present to guests basic ideas on culture of Brac. Dining table for 6, sofa and arm chair included. Towels and bed linen are provided. House cleaning and change of towels and linen is every Saturday. Maid service is optional. Villa Dol is covered with all day lasting shadow provided by an old three (Mediterranean hackberry), leaning on the front part of the house. Garden is wrapped in mesmerizing smell of rosemary, lavender and vividly coloured variety of flowers as well as bird's singing as part of natural sound surroundings fulfilled with silence and absence of car noise. The terrace made of stone is equipped with old-fashioned fireplace, including traditional Dalmatian bell for baking bread and preparing food and includes dinning table for 8 people. There is also a swimming pool (6x3m) with a magnificent view of Postira and the sea. Villa Dol (120 m2) is secluded, on the hill above the village, and provides privacy and intimacy. The property is 1500 m2 large with small olive field behind the house and a garden in front of the house with organic vegetables and colourful flowers. Both inner and outer space provide peaceful and environmentally friendly accommodation, due to its location and natural surroundings which include vast diversity of flora and fauna. I live in Dubrovnik, where I was born. I enjoy sports, specially running and free climbing. I love animals and nature and very often I go for a walk with my dogs. I enjoy cooking and there is nothing more inspiring for me, then to wake up early in the morning and go to the market to buy fresh groceries. I am the owner of the company 'Adventure Dalmatia', which offers tourists a way the spend their vacation exploring the beautiful coast of the Adriatic sea. We specialise in organising hiking, kayaking and biking tours. The island of Brac is the third largest island in Croatia. It is easily accessible from airport in Split and ferry from the Split port takes only 50 minutes ride the the island. Situated in the ethno village of Dol, villa provides the feeling of peaceful and relaxing place, away from traffic and city rush. Crystal clear sea, small beaches and Mediterranean landscape makes it ideal rest place for both body and soul. Dol village is located 2km from the sea and the town Postira. Villa Dol is 200 year old stone house, on the hill above the village of Dol. It is a peaceful Mediterranean house with a magnificent view of the sea across the wine and olive fields of the charming village of Dol. There are kayaks (with life jackets and waterproof barrels) available for the guests of the Villa Dol, free of charge, in town Postira. Living creates great atmosphere thanks to hand-made lamps and wisely chosen literature (Eco-friendly books and travel guides) in order to present to guests basic ideas on culture of Brac. You can relax in the front of the house which has extensive stone terracing and a 6m x 3m swimming pool with outside shower, sunbeds and parasol. The nearest beach is in Postira, 2km far. It takes 5 min by car, 10 min by bike and 30 min on foot. There is also famous sand beach Lovrecina, historical and archaeological site, 6 km far from the villa, as well as several other pebble beaches located all along the coast nearby (Molo Lozna, Rot, Vrilo). One of the most famous beaches on the Adriatic sea, Zlatni Rat (Golden Cape) is located in Bol, on the southern coast of the island of Brac. If interested, there is a possibility of arranging adventure tours organized by Adventure Dalmatia (rafting, canyoning and canoe safari on the amazing canon of the river of Cetina, nearby Split). All information can be provided by the owner of the villa. The nearest town Postira is 2 km far away, harbour Supetar is 13 km, Sumartin (well-connected with Makarska Riviera) 35 km and Milna 30 km. The oldest village in Brac - Skrip, with museum of archeological artefacts, is 3 km far, beach Golden Cape 30 km, Dragon's Cave 33 km, Vidova gora 15km and Blace Hermitage 20 km. Big supermarkets are in Supetar, as well as banks, hospital, pharmacy and rent-a-car service. In Postira you can find cash machine, grocery shops and a market. There are three gas-stations available on the island: in Supetar, Milna and Sumartin. Restaurants are tavern Kastel Gospodnetic in Dol, (5 min on foot), tavern Kopacina in Donji Humac, approx. 12 km and Senjkovic wine-celler in Dracevica, 14 km. Dol village has a population of 130, and the most famous cake in Brac, called Hrapachusha, comes from Dol. You can try it in tavern Kastel Gospodnetic. In Pucisca, you can visit 100 years old stone masonry school. Stone from Brac was used to build some of the famous structures in world, such as Dioklecian palace in Split and the White house in Washington. In Postira you can visit olive oil soap manufacture and gallery that shows art made of olive wood. For adventure trips and leisure activities you can get information from the owner of the Villa (Adventure Dalmatia). 30% extra charge if booking 3 or less nights 10% discount possible if staying longer than two weeks. Check in is at 9.00 am and check out at 3.00 pm. Changes can be made, If requested differently.